Sometimes it seems like we are always “driving by.” With two little girls in the back seat and places to be, we don’t have patience to pull over when we see something interesting. We might comment on it–“Oh, that looks interesting”–I may take a mental note that will soon be forgotten, and on we go. Even without children, Ed and I would drive by interesting places without stopping. Once, we were vacationing in North Carolina. I saw a sign for a street full of art galleries; I wanted to stop, but Ed wanted to keep going. We’ve never been back, and I’ve always regretted it. Perhaps it would have been a tourist trap, or perhaps I wouldn’t have cared for the art. Maybe I would have loved the galleries and would have spend the afternoon drenched in beauty. I wonder. 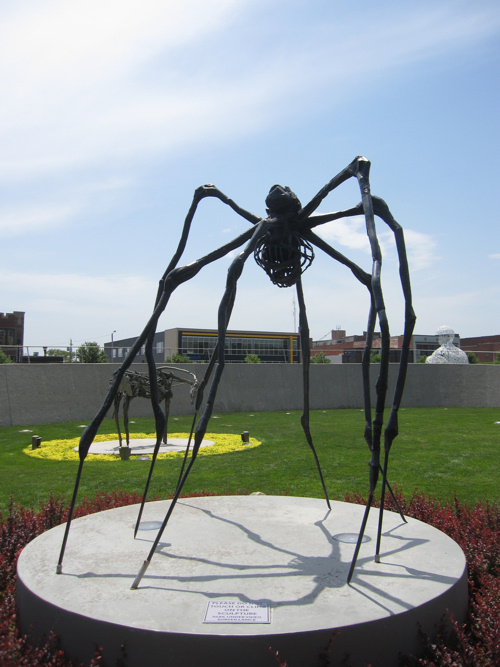 In Des Moines, there is a sculpture park downtown that we have often driven by but never stopped to visit. My aunt thought the girls would enjoy the park, and so instead of driving by this time, we stopped and parked the car. 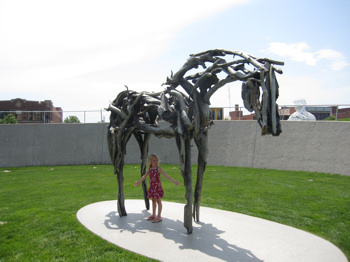 The sculptures are surrounded by wide open grassy spaces, perfect for kids to run around in. Climbing on the sculptures is not allowed, but there are plenty of tall, grassy hills to climb and run down. The sculpture that takes over the landscape is a large white figure made from a scramble of letters. Hugging its knees, it sits nestled in a green bank. The creepiest sculpture is a giant spider, tall and…well, spidery. Two figures, one black and one white, bring to mind rook pieces on a chess board. They are actually backs of snowmen, one black and one white. Just down the street as we walked closer to downtown Des Moines is a meandering fountain. It was so hot and humid that day that my aunt promised the girls they could wade in the cool water. It wasn’t just the girls who dipped their feet into the water…the adults took advantage of the fountain, too. An article in the Des Moines Register which features the Pappajohn Sculpture Park has details and photos of all the sculptures in the park, and we missed seeing some of them because of the heat. Hopefully, the next time we go to Des Moines we’ll be able stop and take another look instead of just driving by. That looks like a lot of fun 🙂 It's nice to stop and check out those things that you always pass by. Sometimes they move/change and you never get the chance. When I was younger we used to drive from PA to FL every summer to visit my grandparents. On the way there we would always pass these huge dinosaur statues and sometimes we'd stop and play on them. There was a little gift shop there that we never went inside of. As an adult I discovered online that they had an entire "museum" behind the gift shop, which is why my folks didn't take us in there. Even though it looks like a junky little place I'd really like to visit there someday with my kids and take them to the "museum" we never got to see. That sculpture park is AMAZING!!! I can't even believe how cool it is! How fun!! I'm going to have to ask my sister if she's ever been there…. Looks fun! These are so cool! Both of my girls loved the pictures 🙂 They are both really into art. Sounds like you had an awesome trip walking around and seeing the sights! We don't have any sculpture parks around here that I am aware of, but I am going to have to look it up. That is so neat. Around here we don't have any sculptures like that. It looked like so much fun! That sculpture made with letters is pretty cool! I wish I could run down the hill like your daughter without falling. lol. 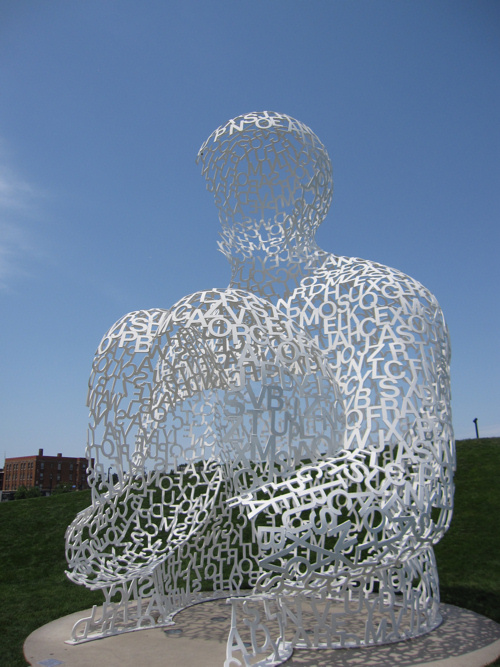 I've never been to Des Moines… maybe some day I'll get there and check out the sculptures. So cool! We have a sculpture park on the way to and from my parent's house. It's somewhere on the New York Thruway in upstate NY and it always look so awesome from the highway. I always want to stop. Maybe next time I will! My recent post Upside Down. It's nice to take a chance and stop somewhere new. I enjoyed your pictures, but I think this place is probably best enjoyed in person. Glad you were able to visit it. Photos don't do this park justice!